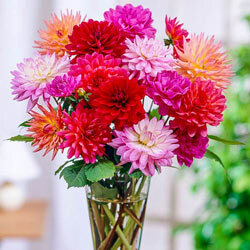 This delightful mix includes dahlias in different colors and bloom sizes up to 8" across. It'll brighten any sunny flowerbed or fresh floral bouquet from midsummer to fall. Developed for the cut-flower market in Holland, the Karma Dahlias® Mixed grow 3-4' tall and have extraordinarily strong stems. Their fully double flowers have outstanding, almost iridescent colors. Best of all, they have a vase life that ranges from 7-12 days. The Karma series, developed by the Verwer Brothers, adds show-stopping color to borders and cut flower bouquets. They're easy to grow and deer tend to avoid them. Lift tubers in fall in zones 3-7. 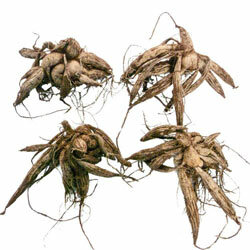 Planting Instructions: Plant tubers with sprouts 1-2" below the soil surface. Soil Requirements: Well drained, humus enriched for best performance.